Six years after its original release, the delightfully devilish dungeon crawler tears its way out of Hell to grace the portable experience that is the Nintendo Switch – and makes itself right at home. There has been a huge push by developers to release past titles on the handheld wonder, providing an opportunity to create these nifty ‘definitive’ editions that also have the radical benefit of being portable, and Diablo 3: Eternal Collection is no exception. For a single price you grab all the additional Reaper of Souls expansion content, as well as the Necromancer class release which (obviously) contained the beloved Necromancer class – but also new enemies and areas to lay waste upon the wicked. There are also some delightfully silly Nintendo exclusive items in the form of a cuccoo chicken pet and your very own Ganondorf cosplay, should you wish to look the villain while smooshing demons. There is also the hilarious option to make use of an Amiibo portal, allowing you to tap your favourite toys-to-life buddy and get rewarded in game, generally by way of getting your teeth smashed in. Tapping my Kirby Amiibo greeted me with a 22-hour cooldown, and a super powerful in-game demon that destroyed my pathetic Necromancer self, which was fitting given that Kirby was involved. Perhaps I’d be better off scanning a treasure goblin next time. Allowing people open slather from the get go, you can leap straight into the story with either a regular character or a seasonal character of your choice – or instead go bounty chasing via the more simplistic adventure mode (usually locked behind completing the game’s story). You can even choose your own masochism by cranking the same plethora of difficulty options available on the PC version up to your heart’s content, nothing is absent. 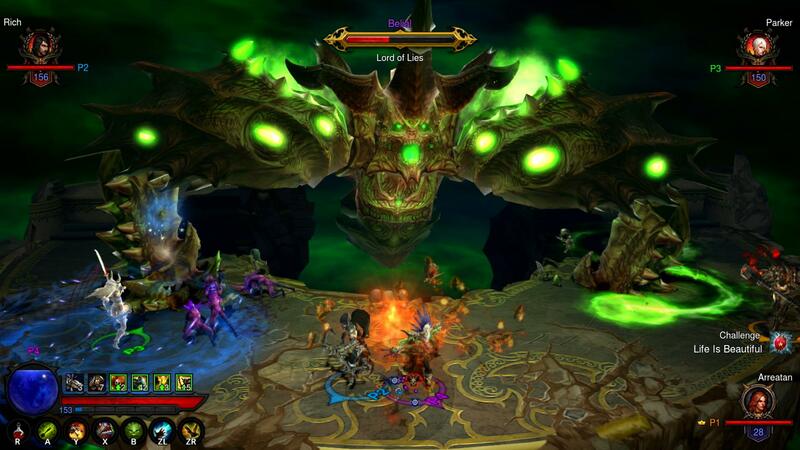 The game play is the standardised consolised Diablo fare, performing brilliantly and intuitively with the controller set up of the Switch, but where the game really shines is the simplicity of playing with friends. Couch co-op is immediately available, and there is no restriction on how you play with others. Throughout my experience I was able to play with a close friend who was sharing a couch with his buddy, while I connected via online – and a further friend joined online also. The four of us then cut a bloody swathe through Chapter III, marvelling at our efficient onslaught. It was painless and perfect, precisely what you want from a co-op experience within a game. The only beef came from our fourth compatriot, who joined the game at a higher level to us. Initially, we were concerned that his uber-powerful self would effectively ruin the experience for the rest of us, as he would surely steamroll everything in his path as we meekly followed behind gathering whatever scraps we could. Instead to our surprise, the game actually artificially boosted both our own power and that of the enemies we were fighting. Instead of doing 270 damage with a corpse explosion, suddenly I was blasting out a hefty 2700 – standing side by side with my higher level mate and holding my own. This was a brilliant experience, right up until our fearless leader had to leave the game, and we were shrank back down to our proper power level…but the enemies didn’t react in kind. In the same moment as my friend left the game, I experienced my first death of the game as a demon swatted me like a gnat; no time to react – just death. My couch-playing companions followed suit, and we each racked up half a dozen deaths before we realised what evil had befallen us. The real kick to the guts was that we had lost a stacking EXP buff that the game mentioned would ‘remain until we exit the game or died’. As it is Diablo, we simply remade the game and all was well – but it was a bummer to experience it at all. Visually, the game runs as impressively as an isometric game from 2012 can run. In docked mode, 60 gorgeous frames per second blast your eyeballs as all manner of evil beasties are exploded on screen. In handheld mode, the game is pretty enough and does not mar your experience – though in darker environments (like those goddamn spider caverns) you do find yourself squinting a little to figure out what’s going on. 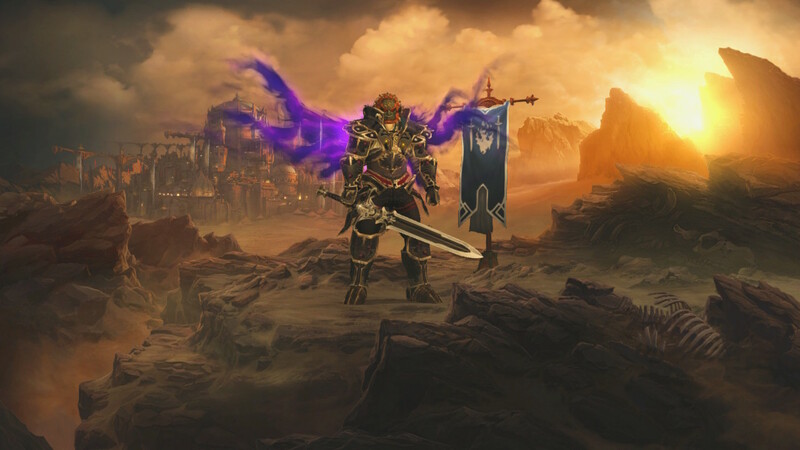 With accessibility at the forefront, offering all gameplay options to all people to play however they want with whoever they want, it’s hard not to recommend this latest incarnation of Diablo to any Switch owner with a penchant for destroying evil. Diablo on the go, baby!